a) Life is a limited company: Body is indispensible to live. To live happily and peacefully, one has to be aware of the capacity of every organ of the body and its functions. d) Swami says that three principal causes for cardiac ailments are hurry, worry and curry. It is the hurry and worry that create mental tension and raise the blood pressure while the improper food upsets the blood circulation and cholestrol levels. The physicians not only prescribe medicines for cardiac ailments but insist on dietary control. Anantapur District, Andhra Pradesh, India. The Copyright and the rights of translation in any language are reserved by the Publishers. 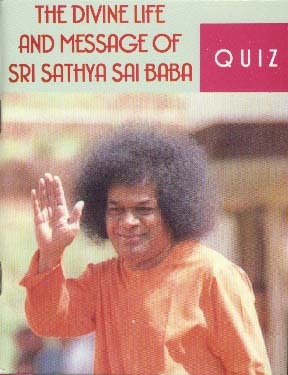 No part, para, passage, text or paragraph or art work of this book should be reproduced, transmitted or utilised, in original language or by translation, in any form, or by any means, electronic, mechanical, photo copying, recording or by any information, storage or retrieval system, except with and prior permission, in writing from Sri Sathya Sai Books & Publications Trust, Prashaanthi Nilayam, (Andhra Pradesh) India, except for brief passages quoted in book review. This book can be exported from India only by the publishers Sri Sathya Sai Books & Publications Trust, Prashaanthi Nilayam (India).